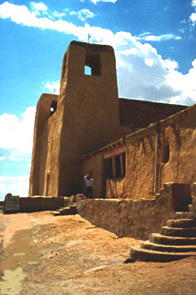 San Esteban del Rey at Acoma Pueblo, the largest of the early southwest missions, dates from 1629. Photo courtesy of Cornerstones. The National Historic Preservation Act (NHPA) of 1966 establishes the governor-appointed position of State Historic Preservation Officer (SHPO) for each state and enumerates a list of preservation-related tasks to be carried out by the SHPO and his or her staff. The New Mexico Cultural Properties Act designates the director of the state's Historic Preservation Division within the "Department of Cultural Affairs" as the SHPO and lists a number of other preservation duties for the SHPO and staff. The Division staff consists of professionals in the fields of history, archaeology, architecture and architectural history, as well as administrative and financial support staff. The Historic Preservation Division gives New Mexico a strong voice in federal government actions that affect the state's historic heritage. The activities of the SHPO are overseen on the federal level by the National Park Service, through which the Division receives funding from the National Historic Preservation Fund. On the state level, a number of activities of the Division are carried out under the review of the state Cultural Properties Review Committee (CPRC), a seven-member governor-appointed board of preservation professionals from all parts of New Mexico. With staff support from the Division, the CPRC grants permits for archaeological surveys and excavations, places properties on the State Register of Cultural Properties and makes recommendations for nomination to the National Register of Historic Places, and reviews and approves state income tax credits for rehabilitation and stabilization of registered properties. Within the system of checks and balances set up in NHPA, the Historic Preservation Division gives New Mexico a strong voice in federal government actions that affect the state's historic heritage. Through the Historic Preservation Division, decision-making about preservation issues is brought down to the state, county and local government levels.